(Francisco Kjolseth | The Salt Lake Tribune) House speaker Greg Hughes addresses the crowd gathered in the Gold Room of the Utah Capitol on Tuesday, March 27, 2018, prior to the signing by Gov. Gary Herbert of H.B. 472, which would expand Medicaid healthcare coverage to cover an additional 60,000 Utahns below the poverty line — pending approval from the federal government. 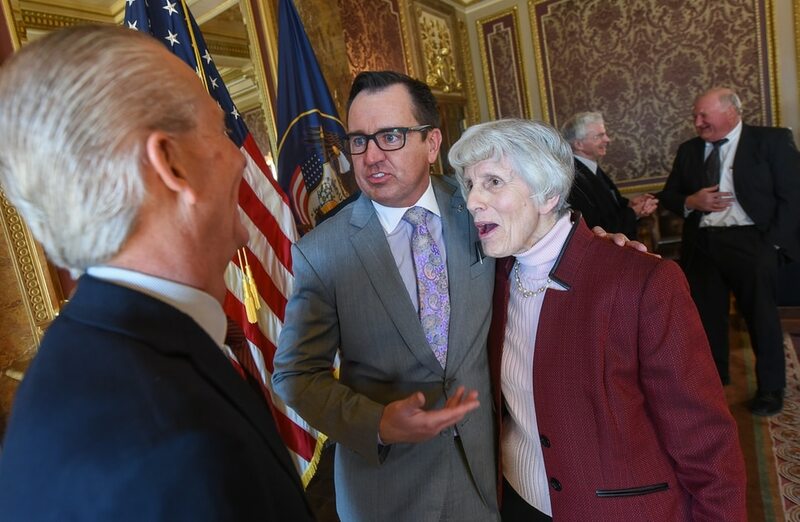 (Francisco Kjolseth | The Salt Lake Tribune) Senate President Wayne Niederhauser, left, and House speaker Greg Hughes joke around with champion for the homeless Pamela Atkinson following the signing of H.B. 472 - Medicaid Expansion Revisions, which would expand Medicaid healthcare coverage to cover an additional 60,000 Utahns below the poverty line — pending approval from the federal government. The bill was signed by Gov. Gary Herbert at the Utah Capitol on Tuesday, March 27, 2018. (Francisco Kjolseth | The Salt Lake Tribune) Gov. Gary Herbert laughs after House speaker Greg Hughes, at left, make a snarky comment about the governor vetoing fewer bills if he gives away enough pens following his signing of H.B. 472 - Medicaid Expansion Revisions, at the Utah Capitol on Tuesday, March 27, 2018. The bill would expand Medicaid healthcare coverage to cover an additional 60,000 Utahns below the poverty line — pending approval from the federal government. (Francisco Kjolseth | The Salt Lake Tribune) The signing copies of H.B. 472 - Medicaid Expansion Revisions, awaits the signature by Gov. Gary Herbert in the Gold Room of the Utah Capitol on Tuesday, March 27, 2018. The bill would expand Medicaid healthcare coverage to cover an additional 60,000 Utahns below the poverty line — pending approval from the federal government. (Francisco Kjolseth | The Salt Lake Tribune) Gov. Gary Herbert is surrounded by state representatives in the Gold Room of the Utah Capitol on Tuesday, March 27, 2018, as he sign H.B. 472 - Medicaid Expansion Revisions, which would expand Medicaid healthcare coverage to cover an additional 60,000 Utahns below the poverty line — pending approval from the federal government. (Francisco Kjolseth | The Salt Lake Tribune) Senator Brian Zehnder, R-Holladay, talks about the challenge of getting H.B. 472 - Medicaid Expansion Revisions to the desk of Gov. Gary Herbert, during a signing ceremony in the Gold Room of the Utah Capitol on Tuesday, March 27, 2018. The bill would expand Medicaid healthcare coverage to cover an additional 60,000 Utahns below the poverty line — pending approval from the federal government. (Francisco Kjolseth | The Salt Lake Tribune) Gov. Gary Herbert, surrounded by state representatives in the Gold Room of the Utah Capitol on Tuesday, March 27, 2018, claps alongside those in attendance after signing H.B. 472 - Medicaid Expansion Revisions, which could provide healthcare to 60,000 Utahns below the poverty line. 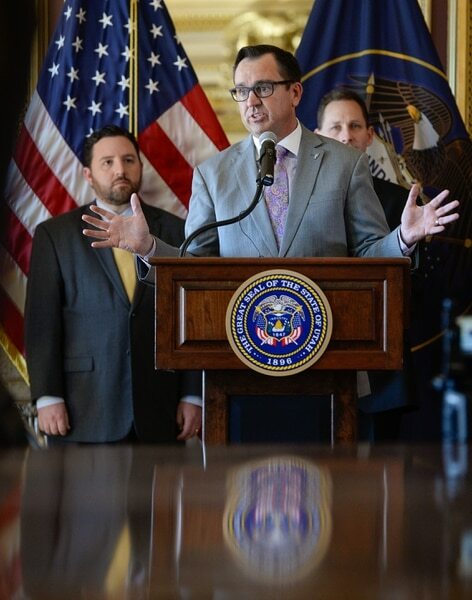 (Francisco Kjolseth | The Salt Lake Tribune) House speaker Greg Hughes addresses the crowd gathered in the Gold Room of the Utah Capitol on Tuesday, March 27, 2018, prior to the signing by Gov. Gary Herbert of H.B. 472 - Medicaid Expansion Revisions, which would expand Medicaid healthcare coverage to cover an additional 60,000 Utahns below the poverty line — pending approval from the federal government. 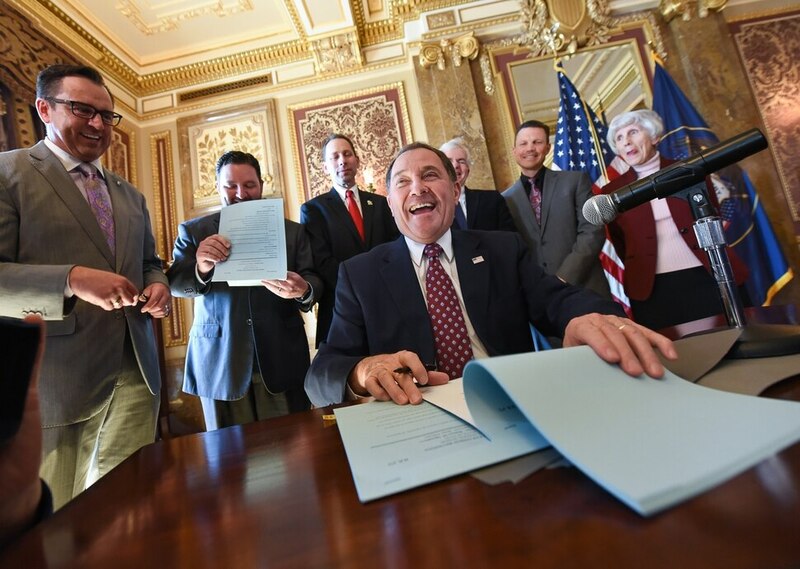 At a signing ceremony Tuesday at the Utah Capitol, Herbert, lawmakers and other officials were nonetheless thrilled to make it this far. Past efforts to expand Medicaid under the ACA failed repeatedly as conservative lawmakers expressed concern over potentially ballooning costs. “This allows us to buy something today, that we can afford tomorrow,” Herbert added of HB472, which includes a spending cap and repurposes money from other Medicaid programs to cover the state’s share of costs. Under the new law, the feds would pay 90 percent, and the program would automatically end if federal officials were to lower that commitment. Total state and federal costs for the expansion would rise over the next few years, reaching about $500 million by 2024. HB472 also requires enrollees to prove they are working or participating in volunteering, vocational training or similar activities. The Trump administration has told state officials it is receptive to such tweaks requested by individual states, which were nonstarters under the Obama administration. Yet it remains unclear if even Trump’s CMS will approve one key provision Utah is proposing. The HB472 plan calls for only a partial expansion of Medicaid coverage for adults making up to 100 percent of the poverty line, or $12,140 annually for a single person. The ACA, meanwhile, mandated that states expand their Medicaid programs to cover those making as much as 138 percent of the poverty line. CMS recently declined to approve a similar request by Arkansas, which wanted to cover only residents making 100 percent of poverty incomes. But both House Speaker Greg Hughes, R-Draper, and HB472’s sponsor, Rep. Robert Spendlove, R-Sandy, said Tuesday they were hopeful Utah’s request would look more appealing to federal officials. Utah, they said, wants to grow its Medicaid coverage, while Arkansas — which had previously approved a full Medicaid expansion under the ACA — was looking to boot people off coverage by changing its income threshold. “Our request is to expand coverage, while their request is to lower coverage,” Spendlove said. And if the feds decline to approve any portion of Utah’s Medicaid waiver request, HB472 would require further consideration by Herbert and legislators. “It’s a package deal,” Hughes said. Pamela Atkinson, a Utah homeless advocate, as well as Bill Tibbitts, associate director of the Crossroads Urban Center, were in attendance Tuesday and supported the measure. They have said it would help low-income Utahns get back on their feet. But others argue it doesn’t go far enough. Officials with the nonprofit Utah Health Policy Project have said Utah’s work requirement and spending caps could result in some impoverished Utahns, who should qualify for coverage, being left out. At the same time, Utah’s Medicaid ballot initiative — if it passes in November — would expand Medicaid to those making 138 percent of poverty income levels, or 150,000 more people than are covered currently. Organizers of that initiative continue to collect the necessary 113,000 signatures to qualify for the ballot ahead of an April 15 deadline. Launched last year, backers of the effort say it reflected years of frustration over the Legislature’s failure to pass an expansion. Polls suggest nearly two-thirds of Utahns support expanding Medicaid. HB472 will soon be the focus of a 30-day public comment period and two public meetings for input before Utah submits its Medicaid expansion request, said Nathan Checketts, director of Utah’s Division of Medicaid and Health Financing. Officials expect it will be at least six to nine months before CMS issues its decision on the waiver. And it could be several months beyond that — into 2019 — before Utah is prepared to enroll tens of thousands of new Medicaid recipients. But the feds did not give any commitments on whether they would approve Utah’s request, Checketts said, or how long they might take to decide.